When was the last time you saw a label that said “Made in China” or “Product of Taiwan?” You might not even pay attention to these anymore because they’re everywhere. But don’t forget that plenty of products are actually made in America. In fact, output in the U.S. has doubled in the last three decades, according to a recent article from MarketWatch. There are more “Made in America” products than you think. Manufacturing is actually the largest and most dynamic sector of the United States economy. It’s at the center of the economy and is highly connected with other sectors like transportation, retail, mining, utilities and business services. Tesla Motors and Method Soap are two examples of manufacturing companies making quality products in America every day. Later in 2016, Tesla will break ground on a new factory in Storey County, Nevada. The entire plant will run on renewable energy from solar panels, a local wind farm and a geothermal electricity plant. In a suburb of Chicago, Method Soap hires from the local area with a mission to serve the community while using mainly renewable-energy sources. 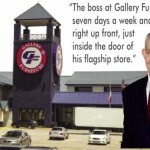 Gallery Furniture is also an example of a company with a rich American manufacturing history. Fine woods, handcrafted finishes and dovetailed joints are all marks of what makes American-made furniture the best in the world. With buyers on the road all the time, we find pieces with truly beautiful craftsmanship to help you create family heirlooms. The next time you’re looking for a quality product, search for the “Made in America” label.